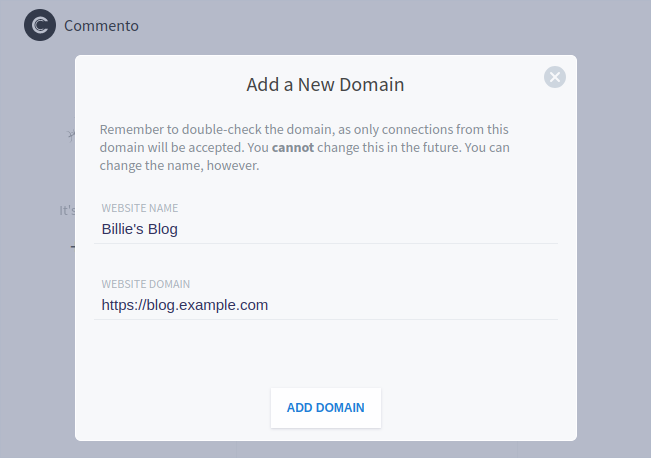 If you prefer to use the cloud service instead of self-hosting an instance on your own server, follow these instructions to embed Commento on your website. Step 1 First, go ahead and create a Commento.io account. Step 3 Use the universal HTML snippet to embed Commento. You can do this by pasting the following HTML snippet after each blog post, for example. And that&apos;s it! You now have Commento on your website with automatic spam detection, fast servers and CDNs, OAuth providers, and much more built-in! Please note that the cloud version of Commento is not free of cost as it&apos;s not sustainable that way. You will be prompted for payment three days after you create an account. All plans have all features and you&apos;re can choose to pay as much as you like depending on your financial situation and need.